Editor's Note: There is a photo accompanying this press release. 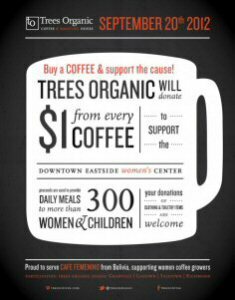 Join us for coffee on Thursday, September 20 as all four Trees Organic Coffee & Roasting Houses in Vancouver and Richmond donate $1 for every cup to the Downtown Eastside Women's Center. Funds raised will help provide daily meals to more than 300 women and children. The public is invited to bring friends and colleagues to make the biggest impact possible in one of Vancouver's most historic communities. "We believe in giving back to our community," says Trees Organic owner Doron Levy. 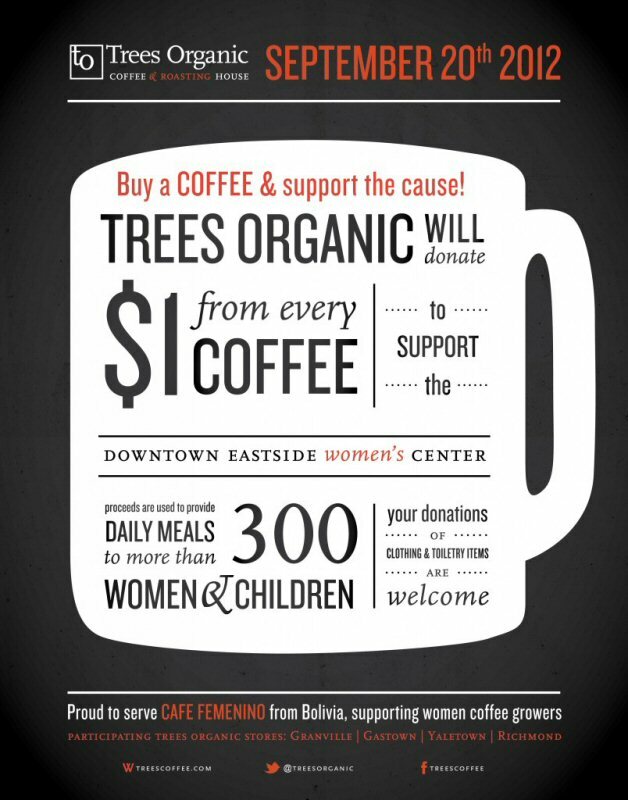 "In June, Trees Coffee joined the Café Femenino initiative. We donate part of the proceeds of our Café Femenino Bolivia coffee to support women coffee growers with an above fair trade contribution that are used to fund social and economic development programs in their communities. This inspired us to work with an organization that supports women in our own community." Founded in 1978, DEWC is one of the few safe spaces within the Downtown Eastside exclusively for women and their children. They provide practical support to over 300 women, children and seniors, every day. As well as providing a refuge and shelter from conditions of poverty and violence, the Centre provides basic necessities. For more information, call 604-681-8480 or go to www.dewc.ca. The Café Femenino Coffee Project is a social program that enhances the lives of women coffee producers in developing communities around the world. Coffee Roasters pay a premium above the Fair Trade price that goes directly back to the women farmers, empowering them as entrepreneurs and giving them the ability to support their families and their communities. Trees Organic has been a proud member of Vancouver's community since 1996 when they opened their flagship store on Granville Street. Since then, they've gone on to open three more locations, treating their community to great-tasting 100 percent organic, fair-trade coffee from around the world. All coffees are roasted fresh at the Granville Street Roasting House, in small batches, ensuring only the highest quality coffee. Trees is also well known for its cheesecakes. Their unique recipe, using all natural ingredients, produces light and creamy - yet decadent cheesecakes in a variety of flavours. Available by the slice or in 3 sizes of whole cake.